The 59th instalment of the Eurovision Song Contest was concluded in Copenhagen, Denmark over the weekend. For the first time in its history, the contest was won by a drag persona, the bearded Austrian Conchita Wurst. As has become a sort of tradition, this blog takes a look back at the visual identity work for this year's edition. Unlike the custom of recent years, host broadcaster DR chose to take the creative direction in-house for this contest. It hired motion graphic designer Uffe Raupach Jenssen to come up with the contest's visual identity with DR's design director Anders Thulin. 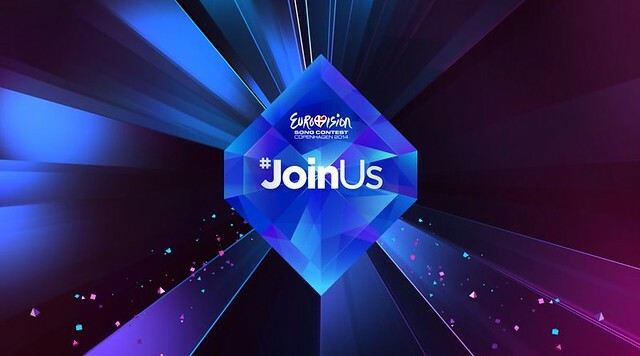 The basic brand idea for the this year's contest was Europe coming together, as expressed by the hashtag "#JoinUs". Visually, this was portrayed by lines and rays of light coming together at the centre of the screen. The logo was first conceived as a square which was tilted and had some corners cut off to form a diamond. The relatively sombre colour scheme dominated by "Nordic" blue was designed not to clash with the many colourful performers on stage. Much of the implementation was handled by outside firms, mostly from Denmark. The musical theme was composed by a Henrik Lindstrand. There were reportedly about 40 different cuts made of the theme music. An opening sequence, designed and art directed by Hello Mono and with creative direction, animation and post production by Frame. Hello Mono also were also responsible for some other elements, such as the map of Europe used during the voting sequence. One of many versions of the theme music. Two more can be heard here. Great suggestions, some of them have been added to the post.